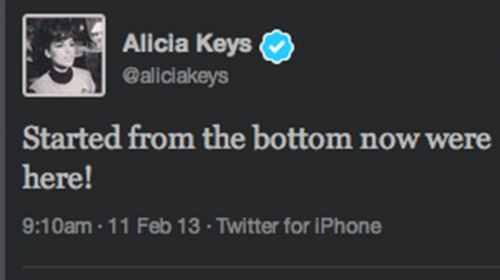 BlackBerry Creative Director Alicia Keys Tweets from iPhone? | BlackBerry Blast! BlackBerry Blast! > News > BlackBerry Creative Director Alicia Keys Tweets from iPhone? BlackBerry Creative Director Alicia Keys Tweets from iPhone? After being named Creative Director for BlackBerry it appears that Alicia Keys may still be using an iPhone. A tweet on her account sent to her friend Drake read, "Started from the bottom now we're here!" The problem is the tweet also said "Twitter for iPhone." Fans soon noticed it, and the tweet was deleted. Unfortunately, Gizmodo had already captured the tweet as you can see above. Uh huh. Looks like Alicia is trying to smooth things over. If someone hacked her account would they really send out an innocent tweet to her good friend? I don't think so. How embarrassing for BlackBerry. At a time when the company needs to differentiate itself from Apple, its celebrity Creative Director apparently still uses Apple's iPhone.